California’s Real Gross Domestic Product (GDP) rose by 3.0% in 2017, according to recent reports. This is level with the 3.0% GDP increase in 2016. Historically, GDP movement is followed by like changes in employment within 12 months. Real estate sales volume and rental occupancy rates follow on the heels of employment decline or, in today’s case, growth. On the other hand, home sales volume moves approximately 9-12 months ahead of home price adjustments and roughly 24 months ahead of GDP change. Home sales volume increased just 0.9% in 2017, compared to an increase of 1.6% in 2016. With sales volume now decelerating, home sales in the remainder of 2018 are expected to remain at 2017 levels and not rise until 2019. The slow movement in sales volume, along with a sluggish global economy, forecasts a less impressive year for GDP growth in 2018. This is the result of real estate pricing grossly exceeding the rate of GDP growth. 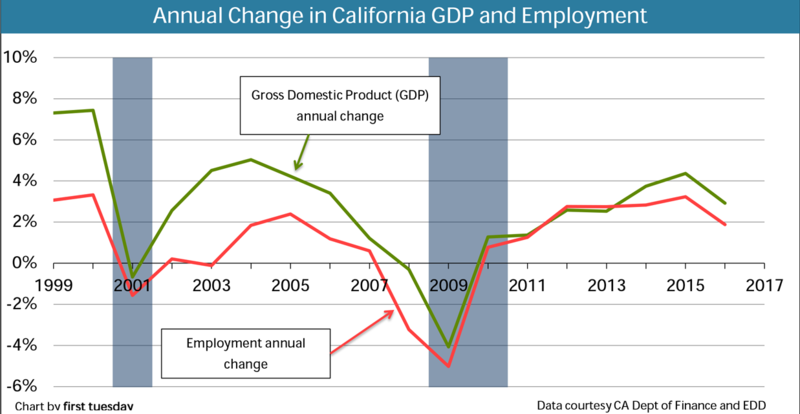 The above charts track Real Gross Domestic Product (GDP) in California, adjusted to 2009 dollars to account for inflation. GDP is a measure of the state’s total economic output: the final value of all goods and services produced statewide. It is used to measure the state’s economic progress and to gauge the financial wealth of the state’s residents. If GDP is up, the economy is healthy, but if it is down, the economy has begun to decline. Does GDP interact with our housing market? Or is it just a passive indicator of the broader economy? GDP measures the state’s economic wellbeing, including the health of the state’s employment. In contrast, the financial wellbeing of the state’s residents is best measured by how much wealth they hold, how much debt they owe, and most importantly, their current level of income gained through employment. 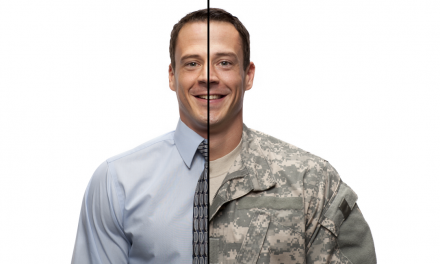 It is mostly the employment aspect which drives real estate transactions of all types. Employment growth is the most significant element needed to improve the fiscal wellbeing of the population. Historically, positive movement in GDP is followed by employment growth within 12 months. Likewise, a decline in GDP is followed by a drop in employment 12 months later. Real estate sales and rents follow on the heels of these moves in employment. Editor’s note: Most home sales are actually excluded from GDP measures. Specifically, only new home sales are included in GDP. All property resales are excluded to avoid counting a sale more than once. GDP change is reflected in home sales volume within two-three years. This cycle runs like a well-oiled machine — provided no one throws a wrench in it. The most recent wrench was the era of mortgage deregulation preceding the Millennium Boom. Deregulation (and subsidies) caused home pricing to careen out of control, inflating GDP while slowing down home sales volume — a distortion from the norm. Eventually the system crashed in the 2008 conflagration of recession and financial crisis. Though job numbers in California recently exceeded the 2007 peak, we are still about one to two years from a full employment recovery. California’s $2+ trillion economy is the largest of any of the 50 states. Its GDP is responsible for approximately 13% of the United States GDP. The incredible significance of the California economy to the nation as a whole can be attributed to the Golden State’s diverse resources: material, intellectual and human. Agricultural products grown in the Central Valley are exported to feed the nation (California is the world’s fifth largest producer of agricultural commodities), and microchips that power the nation’s technological infrastructure are developed in Silicon Valley and exported to the coastal cities of Los Angeles, San Francisco and San Diego. Moreover, California’s population is the largest in the nation, surpassing second place (Texas) by more than a third. All these people buy, sell and produce goods to create and perpetuate wealth statewide. Not coincidentally, a huge proportion of that wealth is held in the housing market. 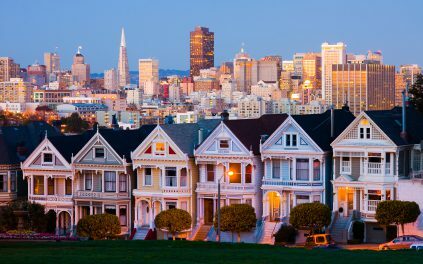 The most significant industries in California include real estate sales, rentals and leasing, which made up 17% of state economic activity in 2008 according to the United States Bureau of Economic Analysis (BEA). GDP is at its height when these industries are thriving with steady employment, strong consumer purchasing activity and high interstate and international trade. Thus, the condition of California as a whole is directly dependent on its housing market. 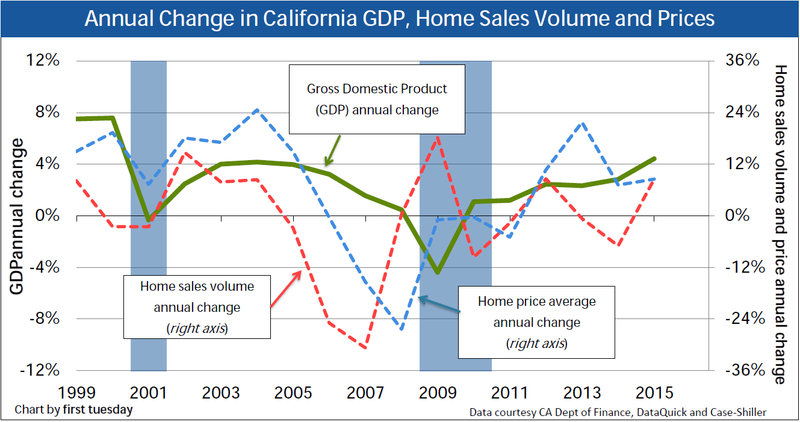 Until California housing returns to pre-recession levels, the state’s GDP will not achieve its highest potential. Likewise, a full employment recovery is needed before the housing market will grow legs to stand on its own (without the aid of government assistance or speculator over-activity). Finally, steady GDP growth is most helpful in creating jobs. So, what is GDP good for? GDP is a valuable tool for making “big picture” assessments about economic health, and measuring changes in national and international buying and selling activity. 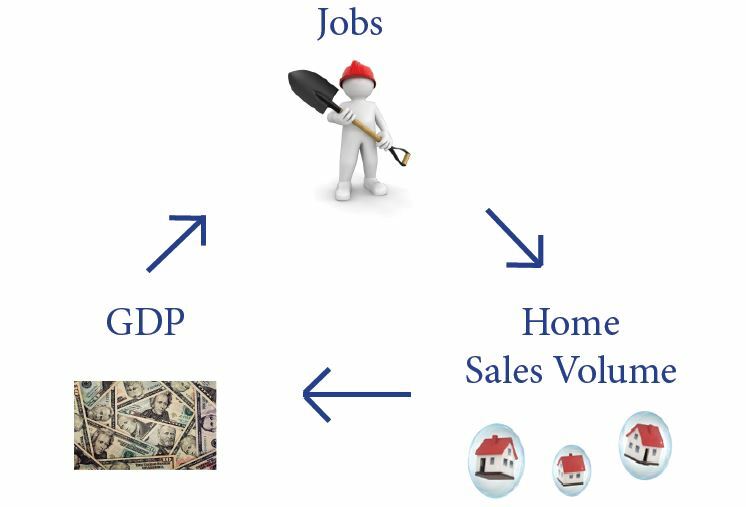 However, GDP is far less useful for forecasting local economic conditions that directly affect peoples’ lives, such as local employment, home sales volume and home pricing. But any real estate agent can tell you that real estate is more refined than simply the big picture; it’s about local areas and individual homebuyers. Your local community may see a quicker or slower recovery in employment, GDP or home sales volume. Still, the majority of counties can expect to ride the same timeline for recovery as the state. Expect state GDP to continue rising gradually in the upcoming years, as employment, personal wealth and home sales continue to recover at a snail’s pace. Editor’s note — For more detailed information about your county, see first tuesday’s regional forecasts, or visit the U.S. Census. Real, accelerating growth such as took place in the late 1990s will finally kick in around 2019. 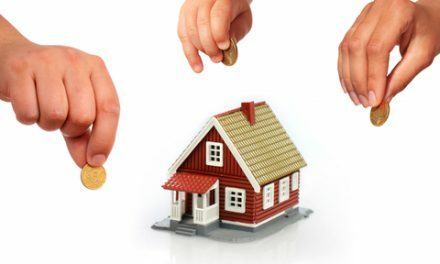 Homeowners will then be able to find jobs in sufficient numbers and at sufficient pay levels to escape their burdensome debt and upgrade their housing arrangements. PreviousPOLL: Is the number of homebuyers with a down payment smaller than 20% increasing?